The Crooked Banana: Healed and back in action! Healed and back in action! Technically, I've been okay since about the last week of July. Technically. But there was so much knitting and sewing to catch up on that I've only just sat down now to tell you about it! Let's see. First, I finished my blocks for Sarah of Sew What Sherlock. You *may* remember we started a bee a loooong time ago. But life got in the way for several of our members and so things fell by the wayside for a bit. But we're gathering momentum once again that will hopefully see us through to the end! 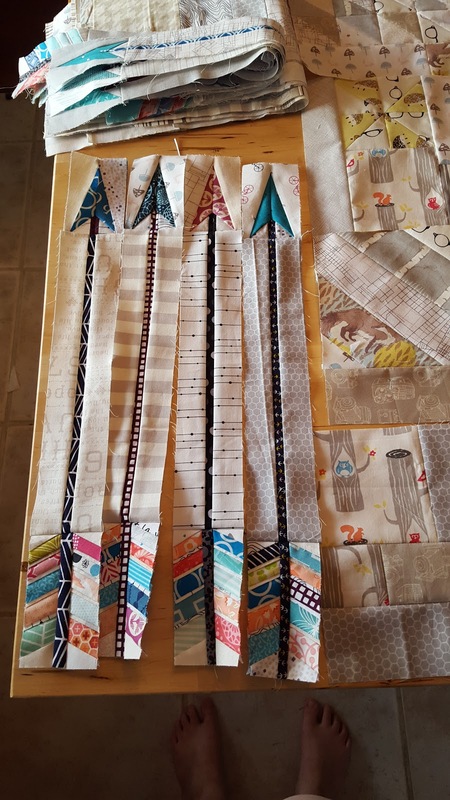 Sarah's quilt is going to have a bunch of paper pieced arrows (the pattern is her own design and available for purchase) with low volume background blocks with a variety of shapes and patterns. The whole this is very scrappy. It's going to be so lovely when it's all put together! Above are my background contributions. And a sort of close up of my favorite block. I just love pinwheels. So. So. good. So excited!! Seriously, I'm feeling all sorts of pressure over here to make pretty background blocks that will be as snazzy as their compatriots! It's all lovely work, and I'm glad you're feeling better!